First and foremost, we seem to have a very gentle Asuka heel turn. 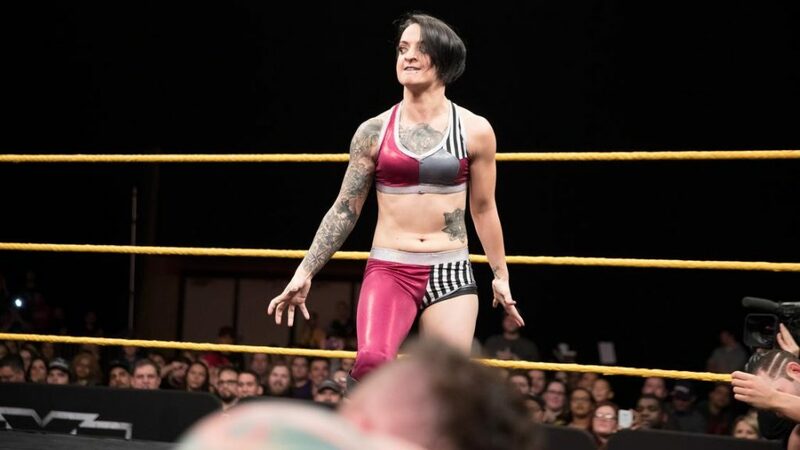 They've been gradually moving her this way pretty much since her rematch with Bayley, as her continued suggess has made her more arrogant and more confident and more vicious, until this week, she squashed her jobber flat, did the I'm Not Gonna Pin You Yet heel m ove, then held the Auka Lock on her WAY past the bell. It's a smart move. I mean, you're never gonna get Full Sail to boo her 100%, but facing off against Ember Moon, you've at least got to shift the dynamic some from pure face/face. The other big deal with the debut of Ruby Riot, as seen above. She attacked Nikki Cross after the Sanity/Team Ten match broke down into a disqualification, standing tall with Dillinger, Jose, and Strong. All kidding aside, she looked really good in her brief debut, has a great name, and I'm looking forward to this continuing. We also got Andrade Almas vs. Oney Lorcan, in a very good match that I had a tough time caring about. Oney Lorcan has become fantastic in the ring lately, but his look, his name, and his previous booking are really tough for me to overcome. And Almas is a guy I keep wanting to like and keep struggling to.